Farmleigh, the official Irish State Guest House, located in Phoenix Park, has several times been the subject of popular media articles and reports looking for a story of government waste. The house and its 78-acre lands were bought from the fourth earl of Iveagh in 1999 for €29.2 million. Many commentators at the time claimed that this was a poor investment and represented a tradition going all the way back to the Free State of the Irish government abasing itself before the Guinness family. But these criticisms have proven to be very wide of the mark for a very simple reason: that the state subsequently gained a book collection which alone is worth the purchase price of the estate. Benjamin Guinness, the third earl of Iveagh, was a manuscript and book collector, with a particular interest in Irish rarities. 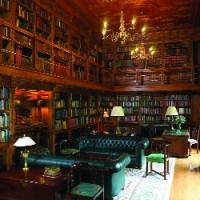 His library consists of over 5,000 items and is a treasure trove of rare editions. It was one of the most valuable private collections in Ireland. 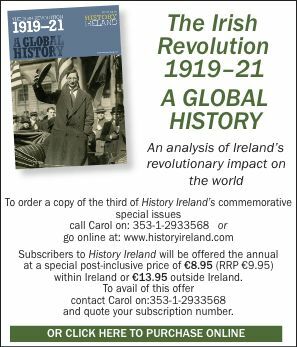 It is also a treasure trove that may now be perused by the public, because in November 2009 it became part of Marsh’s Library, Dublin. The collection remains in situ at Farmleigh, in the wonderfully atmospheric purpose-built library, and researchers—by appointment—can access the volumes there. The library is cared for by the OPW and the current librarian is Julie Cummins. Here are all sorts of collectable items: first editions of famous works of Irish literature abound. The Yeats anthology that I was shown had annotations by the poet in the margins of his work. But I rapidly passed over Ulysses, Gulliver’s Travels, etc., because for the historian there are some absolutely first-rate sources that have been under-utilised up to now owing to the library’s being in private hands. For example, the library contains a chest holding 30 years’ worth of papers of Daniel Charles O’Connell, uncle of Daniel O’Connell. Among this collection is the triumphant letter that Daniel O’Connell wrote to his wife on the day, 24 March 1829, that the famous Roman Catholic Relief Act was passed, repealing the remaining Penal Laws and allowing Catholics to be represented in Westminster (albeit, as James Connolly pointed out in Labour in Irish history, at the cost of disenfranchising the poor Protestant peasantry, who fell below the new £10 freehold requirement for the franchise). Scholars of the early nineteenth century should be rushing down to Farmleigh. So too should historians of the early twentieth century. For there is a collection of Sir Roger Casement’s letters here that deserve more attention than they have received up to now. For those interested in the Gaelic Revival and the Irish theatre, there are archive materials relating to Lennox Robinson. There are also rare periodicals, including titles not found in the National Library or Trinity College. I discovered the library as a result of being awarded the Farmleigh writer’s residency for 2010. Although I obtained this award as a result of my fiction, the librarian, knowing that I also have an academic interest in medieval history, placed before me an astonishing manuscript: a copy of the Topographia Hibernica by Gerald of Wales. Feeling like a character in a Dan Brown novel, I examined the document. It has 27 leaves, ten paper, seventeen vellum. The initials in the vellum section are in red and blue, some of them illuminated with modest skill. Having checked recent articles and books concerning the Topographia Hibernica, I quickly concluded that the manuscript I had been shown was not one which had been consulted by modern scholars. But a recent Ph.D did draw my attention to the fact that a copy of the Topographia Hibernica went ‘missing’ in 1969. The missing manuscript was reported as having a catologue mark, Phillips 26642, and although it was bought by the antiquarian bookseller Alan Thomas, it was not found in his possession on his death in 1981. I alerted the Farmleigh librarian to the possible significance of the manuscript, and we were in fact very quickly able to establish that this was indeed the missing Topographia. Lady Iveagh had an acquisitions record for the library, and for November 1969 there is an entry which records that the Topographia Hibernica was bought as part of a number of items from Sothebys of London. Fortunately its provenance was made clear: ‘Phillips Middle Hill mark and No. 2778 cancelled and replaced by 26642’. Conor Kostick lectures in medieval history at Trinity College, Dublin, and was the writer-in-residence at Farmleigh in 2010.